There really is no doubt that the world is moving back towards centrally-managed provision in computing. Ex-CEO of IBM, Thomas J Watson Jr, in 1943 stated that he believed that ‘…there is a world market for about five computers.’, which is often quoted as an early prediction for technology and computing. In fact, Watson may never have said anything of the kind, but that’s a different story. Either way, we have quickly surpassed this prediction, with much more than five computers in use today. The sheer volume of modern devices is something that nobody foresaw in 1943, with the number of connected devices expected to rise to over 55 billion by 2025, up from about 9 billion in 2017. Many believed personal computers would never catch on in a big way, and that computing would remain primarily a business and political tool, this theory persisted for several decades after Watson Jr’s prediction. So, if we are to take Watson’s words literally and assume he was using the term ‘computers’ in the sense that we use it today, then of course he was wrong. The 40’s saw many crucial innovations to computing, mostly driven by the demands of war. The first example of remote access computing occurred in 1940 in New York, where the Complex Number Calculator was showcased, closely followed a year later by Germany’s development of the Z3, the world’s first programmable, automatic computing device. Later in 1941, the UK debuted the Bombe, a computer designed by Alan Turing to decrypt Axis communications during World War II. Machines, which vaguely resemble what we acknowledge today as a ‘computer’, followed shortly after. But unlike today’s computers, they were so big they required a room to themselves, and almost all were designed to oversee and manage large-scale operations of some kind. The world had to wait until the early 1970s for anything that resembled a personal computing device of the type we use today. So, to put Watson’s ‘quote’ into context, perhaps he foresaw a future where only five large-scale computing applications were required, to handle large-scale data and functionality of national and international importance. And if that is the case, perhaps he was closer to the truth than has been acknowledged. For in many ways, even though there are so many applications, devices and uses for what might broadly be termed ‘computers’ now, we are returning to the a traditional ‘mainframe’ system, with a large-scale, central repository of processing power and data handling capability. Also known as ‘data centres’, ‘large-scale IT service providers’ or even ‘the cloud’. If the period between the 1980s and 2010s saw the explosion of home computing, the Internet and technology in general, it could be argued that the world has grown beyond that, now. The Internet is so vast, so flexible and full of potential, so socially and politically important and omnipresent, it has taken on an identity of its own. The idea that it can be conceived of as merely a series of computers talking to each other, seems faintly ridiculous. The world of technology has become bigger than was ever predicted, the volume of data vaster, and we need bigger concepts to capture these phenomena. One of the biggest of these big concepts is cloud computing, which has evolved partly in response to the proliferation of technology and associated data. In one sense, the cloud in all its forms is the modern mainframe, albeit a vast, behemoth, super-mainframe. The cloud, which in general terms, is a network of remote servers that are responsible for the delivery of services over the internet and the data that comes with it. The sheer volume of data held in the cloud is mind-boggling, and more is being added daily as businesses and individuals migrate their data and applications. The cloud, of course, comprises of organised provision, usually in the form of servers, and usually housed in a data centre. Are the data centres, therefore, actually the returning mainframes of today? Are these the super-computers that Watson foresaw? Alternatively, perhaps we should look to the biggest of the providers to fill this role. The hyperscale cloud providers have brought cloud computing to the masses (quite literally), through provision of a range of user-friendly, easily accessible services that suit everybody. From the teenager with an android phone who likes to edit their selfies, to the largest of businesses requiring dedicated server space, as well as assured regulatory compliance and management – the cloud facilitates everyone and is the key to unlocking businesses potential. Are the only five ‘computers’ that the world ultimately needs, to be found among these companies? Of course, which, if any, of these answers you choose depends largely on semantics and interpretation. The world of technology has changed so vastly since 1943 that it would be astounding if anybody could have predicted the current, cloud-based, world. 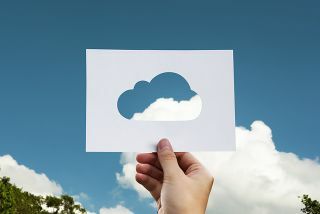 Company use of cloud-based services in the United Kingdom (UK) reached 88 per cent in 2017, encouraging a wide range of applications and services to improve corporate processes. With the use of cloud, businesses can enjoy improved efficiencies in anything from the corporate network infrastructure to easing collaboration among disparate departments, and most importantly, reduced costs associated with maintaining complex IT environments by moving systems from on-premise into the cloud. However, the cloud doesn’t just facilitate businesses; with thanks to consumer tech manufacturers, we can all enjoy innovations that have incrementally transformed life as we know it. For example, smartphone manufacturers have introduced cloud to the masses. Consumers can now access their photos, videos, songs, voice recordings, you name it, from anywhere in the world and from any device. Placing cloud as the central hub to digitally-enabled modern life as we know it, leaving the trustee external hard drives redundant. Well for those that can let go of all dependence on local storage and trust their much-treasured virtual memories into the cloud. Regardless whether this is what Watson had in mind, there really is no doubt that the world is moving back towards centrally-managed provision in computing, due to the great volume and potential application of data, which drives Artificial Intelligence, machine learning, and all of the great events on the horizon.